Posted courtesy of Dr Reluctant. What I call “The Rules of Affinity” are a relatively straightforward device whereby a theological proposition (e.g. that a sinner is justified by faith) is compared with the texts of Scripture by which it is supported to disclose how closely those passages agree with the proposition in question. Thus, a theological proposition may be adduced which has either direct “one-on-one” relation to a text of the Bible (e.g. justification by faith, or that God created the world), or strong reasons for deriving the doctrine from certain texts of the Bible (e.g. the doctrine of the Trinity); or it may have little or nothing to do with any scriptural passage brought forth to substantiate it, especially once the passage is viewed within its context (e.g. propositions such as the covenant of grace or infant baptism). It is understood, of course, that the wrong texts may be mistakenly employed in support of a sound doctrine. These “rules” will help ferret out such misapplications by highlighting the weak link between text and proposition. This does not mean the proposition must be discarded automatically. It may be that other texts of Scripture can be brought forth to fully support the doctrinal proposition. In which case, ones scriptural case for a certain theological belief will only be bolstered. On the other hand, if after successive attempts to align the Bible with a given doctrine fail to produce any clear relationship between them, the proposition must be held to suspect or even spurious. This means that the “Rules of Affinity” have both a positive role and a negative role to play in formulating and testing doctrines. In the first place they have a positive function because they display the biblical basis for any proffered Christian belief. If we take the proposition above about the sinner being justified by faith, this statement can be shown to enjoy the direct corroboration of passages like Romans 5:1: “Therefore, having been justified by faith, we have peace with God through our Lord Jesus Christ” (cf. Rom. 3:30; Gal. 2:16; 3:24). Therefore, our biblical foundation for this doctrine ought in the first place to be grounded in these kinds of passages. Then other less direct but clear passages can be brought in alongside of these initial “direct” passages (e.g. Rom. 4:1-25; Gal. 3:2; Eph. 2:8-9; Jn. 20:31; Acts 15:7-9). It should be obvious that many Bible passages support more than one doctrine. Thus, any text may be viewed as a potential ally to a theological proposition in principle if not in actual practice. But by passing each proposed doctrine through the “Grid of Category Formulations” set out below, it is possible to identify doctrines which have very clear biblical support from those which depend greatly upon the ingenuity of the individual proposer to tie together via subtle inferences, a proposed doctrine and the text of Scripture. One interesting and noteworthy feature of doctrines poorly supported when seen under the “Rules of Affinity” is that they quite often have a powerful effect upon those who have expended mental energy formulating them. It is not unusual to discover major planks of certain theological schools having only threadbare support from the passages from whence they are supposed to be inferred. 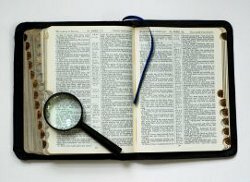 In such cases it is often seen that rather than the doctrine being formulated from the ground up using the Bible it has instead been inferred from another doctrine and then the search has been made to find the requisite biblical texts to substantiate it. More often than not it is these formulations which fair badly when tested for their affinity with the Scriptures in context. In the course of recording and editing seven courses on Systematic Theology (over 200 lectures) for Veritas School of Theology, I became aware of the importance of measuring what I term the “propositional distance” between any given statement of a doctrine and the biblical passages used to support it. I wanted a way of checking this “distance” and came up with my (now) five categories—category 1 through 5, or C1 to C5 for short. C1 and C2 formulations, while they may be nuanced and improved, are non-negotiable. The weight of direct and/or strong scriptural inference in their favor requires that they be held as “fundamental” Bible doctrines. Note: A moment’s thought will bring up the question of it is wise to view, say, interpretations of the Millennium in such terms. After all, if a Christian brother believes in the physical return of Christ but is amillennial in his understanding of eschatology, surely he is not to be considered heretical because he denies the literal earthly reign of Jesus upon this earth after the second advent? We answer that in the case of the millennial issue, since there is neither any effect upon the message of the gospel, nor any direct attack upon the character of God, such persons should not be viewed as heretical, but simply as entertaining certain teachings based more upon human reasoning than upon the evidence of the texts of Scripture. But in other cases, e.g. as with the doctrine of justification or the Godhead, any deviation from C1 or C2 formulations must be seen as either highly suspect or else heretical. It is for this reason that many Christians whose theology has weak affinity to the texts supporting it will reject these rules outright, even though in practice they will try to find those Scriptures which most closely reflect their doctrines. C3 formulations are inferences to the best explanation based on the evidence of various Scriptures. As such, they are defeasible. That is, they are open to being overturned if better scriptural arguments for another position can be brought forth. Because C1 through C3 formulations can be measured against the clear statements of Scripture without the need for inferring one doctrine from another, these are the only “safe” categories from within which to construct a biblically based evangelical theology. C5 = a proposition based on a theological inference which itself based on other theological inferences without reference to plain statements of Scripture (e.g. Sunday being “the Christian Sabbath” and replacing the Jewish Sabbath; infant baptism and salvation inferred from inclusion into “the covenant of grace”). Dispensationalists (who under these rules would really be “Biblical Covenantalists”) who ground their views on literal grammatico-historical interpretation ought not to traffic in C4 or C5 formulations, since these are not linked to the plain sense of Scripture and have to take advantage of a theological hermeneutic at variance with the “dispensational” system. I follow your line of thinking; however, isn't there a category for propositions such as election, predestination, and free will which have scriptural evidence to support conflicting viewpoints yet do not affect other major doctrines? These rules test whether any given proposition has the kind of clear biblical support claimed for it. It tests each proposal, whether it be, e.g., a proposal for corporate election or for individual election; for single or double predestination and what sort of predestining is in view. Likewise, one might assert a proposition in favor of, say, radical libertarian freewill. Then the Scriptures used to support that assertion, in all its points, would be examined to see how strongly the wording of Scripture matches the wording of the doctrine under consideration. It doesn't do everything. Counter-proposals can be passed through the same Grid, and perhaps be shown to be less well supported directly. These "Rules" help us to see better how we are employing the Bible to back up our theology. That is their function. Thanks for posting this Dr. Henebury. I have been in a conversation with a Church of Christ seminary student over baptism and I need to work the texts through this grid. It appears that the necessary work that makes these rules useful is that of correct interpretation. This gentlemen did little more than quote Acts 2:38 and Mark 16:16 making baptism a c1 and thereby introduce a subtle form of baptismal regeneration. Am I on the right track or asking the rules of affinity to do what they are not intended to do? First, you need to have a statement from him of how he uses his texts. For example, baptismal regeneration requires that it is the waters themselves which mystically create the new birth, albeit through the Spirit. Acts 2:38 stipulates the need for repentance before baptism. In Acts repentance is synonymous with faith (3:19 - "and turn"; 8:22; 17:30; 26:20 - "and turn"). But further, Acts 2 should not be seen as normative for us today. Strange things were happening. It is best to see things as in transition (see also the special laying on of hands in Acts 8). Because repentance equates to faith in Acts it is the determinative thing for true baptism. The text is hard, but in light of what I have said receiving forgiveness of sins is predicated on belief not baptism. See F.F. Bruce on this construction. Notice also that if we take the Ch. of Christ line we must follow it all the way and make the forgiveness of sins occur before receipt of the Holy Spirit. That may be okay for them, but the best someone wanting to prove that repentance and baptism procure forgiveness of sins can expect is a C3...BUT when other plainer texts are brought in, like 1 Cor.1:17a: "For Christ did not send me to baptize, but to preach the gospel" the claim to right interpretation for baptismal regeneration dissipates. We must then assign it a C4. Mark 16:16 is of a similar sort. It is transitional (v.18 despite some snake handling folks back in the hills). Too, the second clause "he who believes not shall be damned" clearly throws the emphasis on faith not baptism. Baptism follows faith but the difference between salvation and damnation in the verse is faith. Hence, the unusual transitional context and the stress upon faith militate against the opponents view. His proposition - and you would need to have him state it in relation to the verse - would not rise above a C4 for these reasons. Doubtless he thinks these texts are C1's or C2's for his position. When what they say in context is examined and placed alongside his assertions, his view looks shady to say the least. Paul, I love your categories and distinctions. I think you are on the mark. A less detailed (and inferior) -- but good -- "hands on" approach is to say that we should develop our beliefs inductively, but do a deductive check to make sure we have concluded correctly. When we develop a number of threads inductively (e.g., There is one God, Jesus is man, Jesus is God, Jesus is the Son of God, The Son of God is not the Father nor the Spirit), we then -- from careful, debated human reasoning -- develop a way to integrate all of these truths. The result would be two propositions (The Trinity and The Hypostatic Union). We then do the "deductive check" to make sure our propositions fit what we actually find in Scripture. If not, we modify our propositions until they do. I read a quotation from someone years ago, "People are most dogmatic about what they cannot easily defend." We see this with levels C-4 and C-5. Pressure, name dropping, emotional arguments, and especially sarcasm are the weapons used to defend some of these. Anyhow, I really enjoyed your article. Thank you for it. The last post in this little series will address the limitations of the Grid. But I have found the "rules" to be exceedingly helpful in organizing my theology. A wonderful explanation of an important process. Thanks for posting this! Kind of you to say so Peter! Kind of you to say so Peter! God bless you and yours.